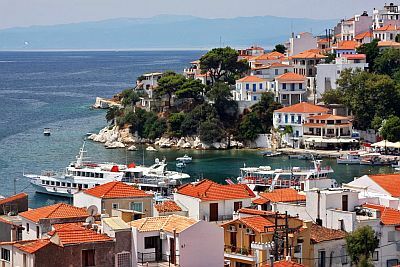 The climate of Skiathos, a Greek island belonging to the Northern Sporades, is transitional Mediterranean, with relatively cold, rainy winters and hot, sunny summers. The daily average temperature ranges from 6 °C (43 °F) in January to 23.5 °C (74.5 °F) in July and August. Being at a short distance from the mainland, the island in winter is subject to outbreaks of cold air, while in late spring and summer it may occasionally receive some showers or thunderstorms coming from the same continent. The island's interior is covered with hills, which reach about 400 meters (1,300 feet) above sea level, and it's green. 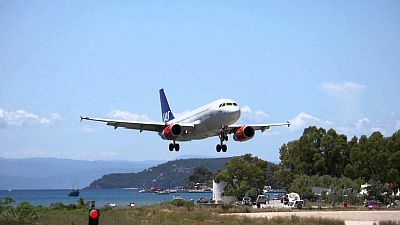 The airport is located at a short distance from the largest city, and the track is two steps away from the sea and the harbor. The rains follow the Mediterranean pattern, so they are more frequent from October to April, and are not abundant, since they amount to 630 millimeters (24.8 inches) per year. As mentioned, rainfall in summer is rare, and occurs in the form of short showers or thunderstorms. Here is the average precipitation. Winter, from December to mid-March, is pretty cold: the maximum temperature is on average about 9/12 °C (48/54 °F), but there can be mild periods, with highs around 15/18 °C (59/64 °F), and cold periods, when highs remain around 5/7 °C (41/45 °F), and with a moderate or even strong wind that heightens the feeling of cold. In addition, sometimes, and not too infrequently, it can snow, and at night there may be frosts. The rains are quite frequent; the rainiest month is December. Spring, from mid-March to May, is mild, though with some periods a bit cold, windy and rainy, which gradually become less frequent. Summer, from June to mid-September, is hot and sunny, with rare showers. Typically, the maximum temperatures hover around 30 °C (86 °F) and rarely exceed 33/34 °C (91/93 °F), but the air is a bit humid. Autumn, from mid-September to November, is pleasantly warm at first, then gradually becomes milder. The rains gradually become more frequent, although in September and the first half of October there are still entire weeks without rain. In November, the first days a bit cold and windy begin to occur, and sometimes also in October. The amount of sunshine in Skiathos is very good in summer, when clear skies prevail, and it is good also in May and September, while in the rest of the year it is not so high, since there are several cloudy periods. The temperature of the sea, still cold in May and cool in June, when it's around 21 °C (70 °F), becomes high enough for swimming from July to September, when it reaches 23/24 °C (73/75 °F). Here are the average sea temperatures. The best time to go to Skiathos for a beach holiday is summer, from June to mid-September. In June, and sometimes in early July, there can be some cool evenings, so it's better to bring a sweatshirt for the evening. In May, not only the sea is cold, but sometimes there can be some cool days, with highs below 20 °C (68 °F), especially in the first part of the month. If you want to go on excursions on the island, you can choose May and September. 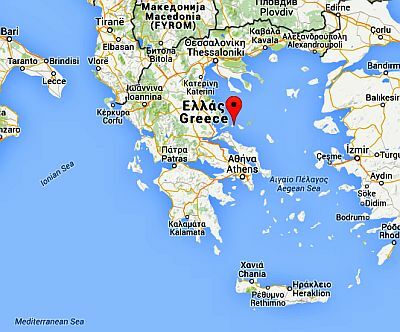 Back to the Sporades Islands.